Hi All , New to the forum . I am in need of help . Been racking my brain and the web to no avail . I have a 1970 Ford Ranchero Squire . 351c , C6 trans. , Turbocharged , carb. I'm trying to find a vacuum switch that I can turn on my electric fuel pump . The mechanical pump run ok until i build boost then the fuel pressure goes from 7.5 psi to 2psi until I let off the accelerator . I can't seem to find a pressure switch that would enable me to turn on the second pump , the only ones I can find are the oil safety switch that shuts off the pump . Any Ideas would greatly help my effort . Thank you in advance . These are called hobbs switches, there are a lot of OEM applications. I got my Hobbs switch today . Another question I have is : Is it possible to mount the switch into the fuel line after the regulator or is that an unsafe condition ? My oil port in the manifold is supplying the turbo with oil . so its either the fuel line installation or possibly the vacuum pressure rail I have that the turbo pressure gauge is mounted in . A good suggestion on a location would be fantastic . Thank you for your help so far . What function does your switch do? Vacuum, Pressure ? What's it set at? They do make hobbs switches for fuel pressure, so yeah if that's what you bought it should work on your fuel line fine. The one I got is from NAPA (Pressure Switch 701-1575) It's Set at 4psi from factory and is adjustable from 4-9psi . It had a warning sheet inside saying oil only . That's why I was asking . 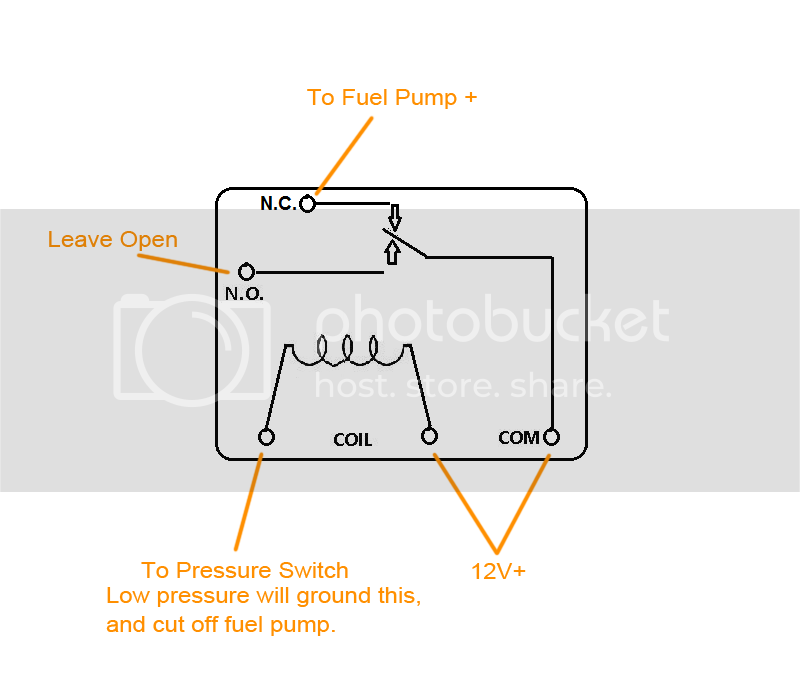 I want to have the switch turn on my fuel pump at 5psi so I don't lose pressure. I was thinking that if I put it inline with my Turbo boost pressure , when the boost comes on 5lbs. and up it would keep the pump on . The more I thought about it , if I was to lose fuel pressure below 4psi the pump would shut off if I put it in the fuel line . Would my assumption be correct ? It's hard to say if the diaphragm in the switch is compatible with fuel, good chance it is however that's just a guess. If it's for an oil pressure switch, I'm going to guess when the pressure drops below your set point it will ground the terminal through the body (single terminal). That would mean you would have to mount it somewhere where it can go to ground (not in the middle of a fuel line). Does it have one terminal or two? That boost pressure switch I post a link to might work better for this purpose.. It's a 2 terminal . I tried today to see how it would be in the Air pressure rail but only got to test on a short run . Will have a better idea when I go on a longer run and fill the tank to full . I appreciate your input . (A note about the pressure switches) The specs. on them are very vague , hard to find out exactly what the internals are . I'll keep ya posted . Car runs like a bat out of hell as it is , I must say . You would set it up with a SPDT or DPDT relay. When boost is below the pressure you set it at it will ground the relay and switch to the unused normally open side turning the pump off. When boost is above it will lose the ground and allow current through the normally connected section, turning the pump on.